Elegant and fruity at the same time with a quick invitation from bright, pure cherryish notes and then filled out handsomely by whiffs of chalky soils and well-integrated, rich and uplifting yeast-driven scents, this wine manages to be both vigorous and layered at one and the same time. Its bubbles are insistent, finely carved and add to the early sensations of lightness and energy yet also carry the wine long into a balanced, refined finish. And its latter palate grip is exactly what one should expect from the genre. While service with light foods would be our first choice, this one has the beauty to stand alone. 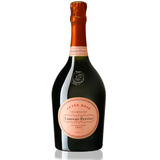 An elegant rosé, with flavors of dried cherry, oyster shell, candied ginger and orange peel riding the delicate mousse. Shows fine integration of the sleek acidity and smoky minerality. Drink now through 2021. 9,000 cases imported. Orange-pink in color, this dry wine has some good bottle age that has rounded the corners and allowed toast to join the red fruits and orange zest flavors. A complex background of acidity, structure and final tautness makes this wine ready to drink now.